As a former German capital, Bonn has established a global network of relations and contacts in the fields of environment, development, and science. Bonn’s around 320,000 citizens are multicultural, educated, and cosmopolitan. As “Federal City” – the second political centre of Germany and seat of many Federal Ministries – Bonn is also a host city for many international and internationally active NGOs and is the German United Nations City. 20 United Nations organizations, programmes and offices are located in Bonn. These organizations operate in a wide variety of areas, but all are connected through the contribution they make to sustainable development. WHEN DO I NEED TO ARRIVE IN BONN? The Festival will run from 2 – 4 May 2019, with pre-registration due to open on Thursday 1st May. You can connect with other attendees, see the venue map, find out more about the speakers, create your own personalized schedule and much more by downloading the SDG Global Festival of Action app, available on Google Play and Apple’s App Store. Download the app and help us deliver a paperless conference! 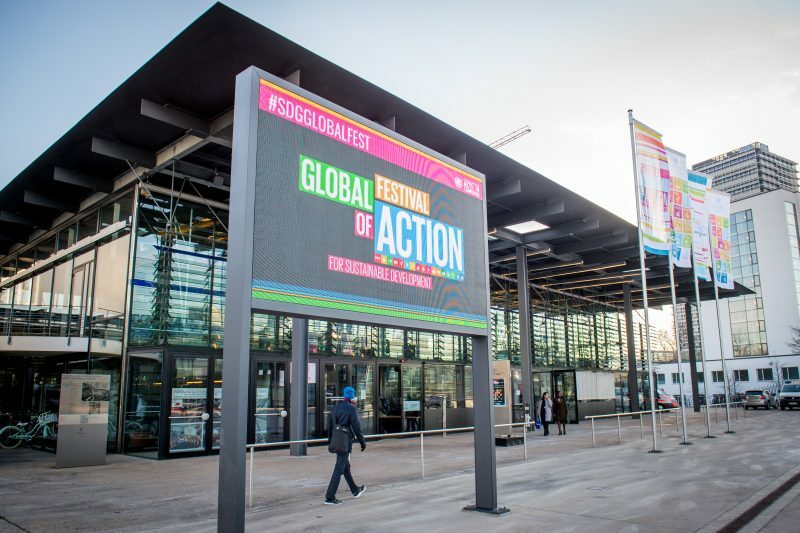 The SDG Global Festival of Action will be held at the World Conference Center Bonn (WCCB). The venue of the Forum is the Plenary Building (Plenargebäude). All foreign delegates/participants entering the Federal Republic of Germany must have a valid passport (passports need to be valid for the whole period of the event plus six months after it). Participants requiring an entry or transit visa are strongly encouraged to contact the appropriate consular authorities as soon as possible. For more information, please visit the website of the Federal Foreign Office: http://www.auswaertiges-amt.de/diplo/en/Startseite.html (also available in French and Spanish). Please note that the Schengen States’ Visa Information System (VIS) has been operational since 2011. More information can be found here: http://ec.europa.eu/dgs/home-affairs/what-we-do/policies/borders-and-visas/visa-information-system/index_en.htm. An agreement between the UN and the Government of Germany allows UN laissez-passer (LP) holder on official mission to enter and exit Germany without a visa. Please hand-carry your LP, National Passport and event invitation. For all airports: After exiting the airplane, please proceed to the immigration/passport check, go to the luggage pick-up area and then proceed to the local transport towards your final destination. Please tag your luggage clearly with your name and the Bonn hotel address! This will be needed in case the luggage goes missing, since only the airline, not the conference organizer, is responsible in such cases. Bonn is serviced by three international airports: Cologne/Bonn, Düsseldorf and Frankfurt/Main. Train timetables are available at: http://bahn.hafas.de/bin/query.exe/en. The journey from Frankfurt/Main airport to Bonn takes around 1-2 hours by train. The train station is at the AIRail Terminal, right next to Terminal 1. Trains arrive at and depart from platforms 4 to 7. The train station ‘Frankfurt Flughafen’ is linked to Terminal 2 via buses and the Sky Line. To get there from the platform (Level 0, Area B) go up one floor, following signs to Terminal 2. When in Area B or C, use the free Shuttle Bus to get to Terminal 2. Alternatively, follow signs to the Sky Line in Hall B. This service to Terminal 2 runs at 2-minute intervals. Important: You are not permitted to take trolleys onto a Sky Line train. It is best to take a high-speed train (ICE) to the station “Siegburg/Bonn”. If you don’t have a Rail&Fly ticket, make sure to buy a train ticket at the DB Travel Centre or at the ticket machines. From the train station “Siegburg/Bonn” you can take the tram number 66 (Telekom Express) bound for Bonn, Ramersdorf or for Bad Honnef. You will need to purchase a ticket for the tram; choose the price category/ “Preisstufe” 3 for 5.00 Euros. Your stop is Bonn Hauptbahnhof (central station). It is very expensive to travel from Frankfurt to Bonn by taxi and we recommend you use the train. Train timetables are available at: http://bahn.hafas.de/bin/query.exe/en. Please note that international flights landing in Düsseldorf or Frankfurt with final destination Cologne/Bonn are connected by train to Cologne/Bonn and not by air (Rail&Fly). Many travel agencies outside Germany are not aware of this so the traveler is not informed. Therefore, even if your air ticket indicates final destination Cologne/ Bonn, you may want your travel agency to double-check. If you have a Rail&Fly connection, you will have to print your train ticket at one of the DB vending machines as per the instructions on the ticket. If your ticket does not include the train to Bonn you need to purchase a ticket. Take subway (German: U-Bahn) line 16, 63 or 66 towards Bad Godesberg/Koenigswinter. Get off at “Heussallee / Museumsmeile” and follow the signs to the Bundeshaus/World Conference Center Bonn. The walking distance from the subway station is about 250 meters (just straight ahead). Follow Heussallee to the junction with Platz der Vereinten Nationen. Turn left onto Platz der Vereinten Nationen. Take bus no. 610 or 611 from Bonn central bus station (opposite of Bonn central station) and get off after approx. 10 minutes at the bus stop called “Deutsche Welle/Heussallee”. Follow the Heussallee to the junction with Platz der Vereinten Nationen. Turn left onto Platz der Vereinten Nationen. The Main Entrances of the World Conference Center Bonn are located 100 meters down the street. If you need to purchase transport tickets, we recommend that you buy a “4er Ticket” (a strip of 4 tickets) in advance, there are vending machines at some tram stops and underground stations where you can do this. Please bring cash in Euros for the purchase of tickets as credit card is not accepted. One-way tram and underground tickets within Bonn are the 1b CityTickets and cost 2.80 Euros; the “4er Ticket” costs 11.30 Euros. Please note that each journey requires validation using a machine on the underground/tram. You can also purchase the 1b “Wochenticket” for 25.40 Euros, which is valid for all travels within Bonn city limits for the duration of one week. The fare for a 10 minutes’ taxi ride to the WCCB (Platz der Vereinten Nationen 2) from Bonn city centre and central station is around 10 Euros. The organizers of the Festival disclaim all responsibility for medical, accident and travel insurance, for compensation for death or disability, for loss of or damage to personal property and for any other costs or losses that may be incurred during travel time or the period of participation. In this context, it is strongly recommended that you obtain international medical insurance for the entire period of participation, including travel time. Participants are responsible for arranging their own hotel accommodation at their own cost. Please find here a list of hotels in Bonn. If you decide to make your reservation in one of these hotels, please note that the UN SDG Action Campaign has not negotiated any special rate with them. Please note that the City of Bonn will be very busy hosting several conferences and forums during the month of May and we would advise you to book your accommodation as soon as possible. Make sure to have cash with you during your stay in Bonn. It is highly recommend for visitors to withdraw or exchange cash for Euros at the airport or main train stations beforehand. Although credit cards are becoming more accepted in Germany, several restaurants/shops only accept German EC Cards and you might be required to pay in cash on several occasions. Note that you need cash to purchase transport tickets, and the World Conference Center only accepts cash for meal purchases during the Festival. ATM/Cash machines (Geldautomat): ATMs are found in the city center (Sparkassen-Finanzgruppe / Deutsche Bank). Withdrawing money from a Geldautomat of a different bank than your own may cost extra. Sometimes the extra charges are a percentage of the amount withdrawn and sometimes a flat fee is charged. The costs can range from €1.00 to €10.00. The registration desk opening times as well as necessary documents to register will be announced in due course. Please check the website for updates. Security will be strictly enforced at the venues. To ensure the safety of all participants, badges must be displayed at all times inside the venues. Under no circumstances should your badge be lent to another participant. At the entrance to the venues, participants may be required to pass through security checks and to have their belongings screened and, if necessary, searched. Refreshments will be provided to all conference participants free of charge. Lunch can be purchased from a dedicated restaurant space within the venue. Note that participants must bring cash (Euros) to purchase meals at the venue, no credit cards are accepted. A wireless network will be available throughout the venue. First aid, prayer room and breastfeeding rooms will be available at the venue. 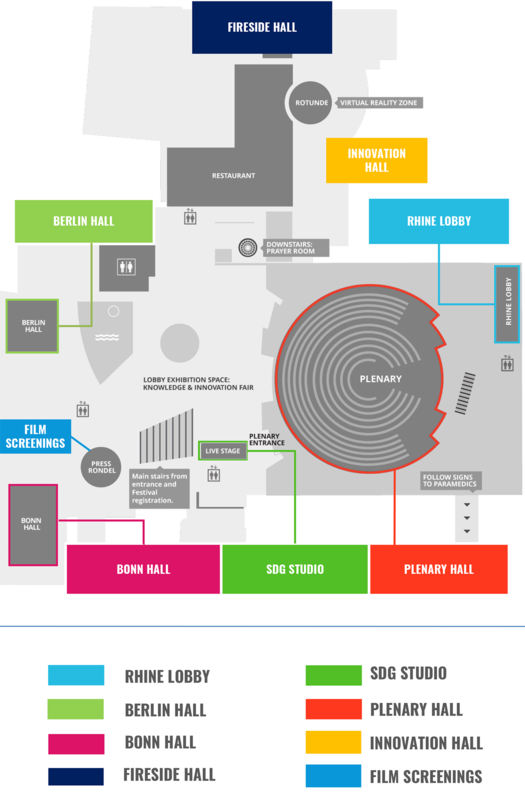 Signposts will be located throughout the venue to answer questions regarding the location of events and meeting rooms. The organizers aim to remove altitudinal and environment barriers that create exclusion, undue effort, separation or special treatment. This enables everyone – regardless of disability, age, gender, faith – to participate equally, confidently and independently with choice and dignity. Assistance during the Global Festival of Action for Sustainable Development: If you require assistance during the Global Festival of Ideas, please make staff at the Reception aware on arrival or contact the organizers in advance at info@globalfestivalofaction.org. International dialing code for Germany: +49. Germany is located in time zone GMT +1.